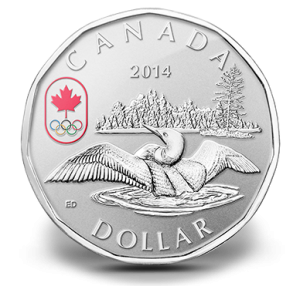 As part of the celebration, the Royal Canadian Mint offers the 2014 Lucky Loonie Fine Silver Coin. This release is struck from 99.99% pure silver and features the Canadian Olympic Team logo in color. "Designed by Canadian artist Emily S. Damstra, your coin portrays the original loon design of Canada’s 1-dollar circulation coin in a unique way," describes a statement on the Royal Canadian Mint's website. "The common loon is depicted from behind as it spreads its wings in a territorial display, one of the species’ most elegant and recognizable poses." The coin is featured in reverse-proof with enhanced detail added through a variety of finishes and engraving techniques. CANADA, 2014 and DOLLAR can be found inscribed on the reverse. As with all Canadian legal tender coins, the obverse shows Susanna Blunt's effigy of Queen Elizabeth II. The portrait is surrounded by the inscriptions of ELIZABETH II and D G REGINA. 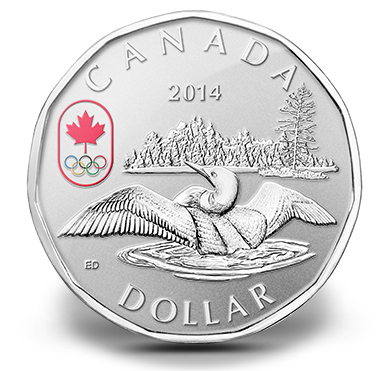 The 7.89 gram coin is available for purchase directly from the Royal Canadian Mint for $39.95 CAD. A Royal Canadian Mint-branded maroon clamshell with black beauty box is included with each purchase. Mintage is limited to only 15,000.